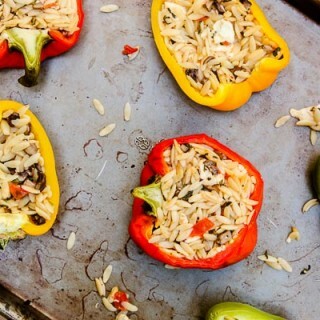 My love of stuffed bell peppers came from my first recipe, Brown Rice Stuffed Peppers. Who knew you could pack a delicious bell pepper with a flavorful stuffing, bake it, and have yourself a healthy, simple, quick, and delicious meal. 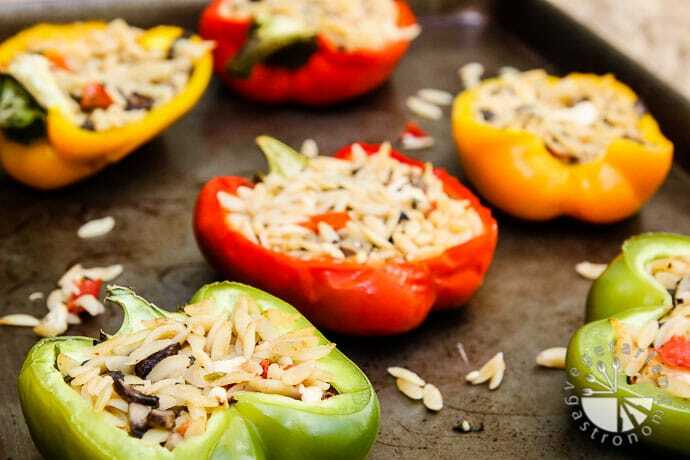 It’s a great dish to prepare ahead of time for the week by stuffing the bell peppers and keeping them in the fridge until you’re ready to bake and serve. The stuffing flavors are endless! I personally prefer to stuff my bell peppers with something savory to complement the sweetness of the baked bell pepper. That way, each bite is perfect and touches the palate on many different levels. It’s about time I came up with another stuffed bell pepper recipe, especially after recently seeing all those gorgeous multi-colored bell peppers on sale at Sprouts. This recipe is light, refreshing, and flavorful. 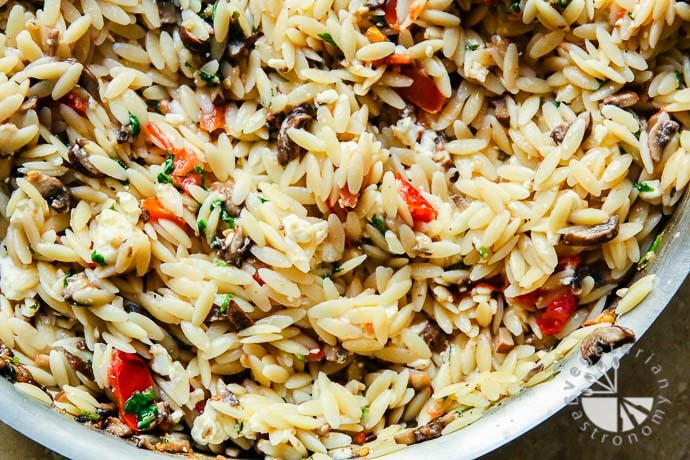 The stuffing is the result of a eagerness to use orzo pasta. I had initially bought orzo pasta, because I thought they were the perfect size for my daughter. However, not all pasta sauces go well with its shape. 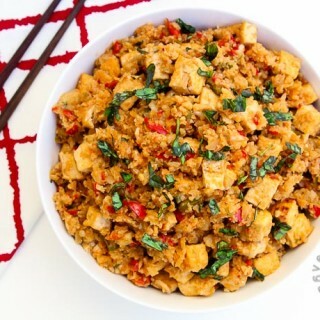 I now mainly use it in salads or soups, but found it to be a winner as a bell pepper stuffing. 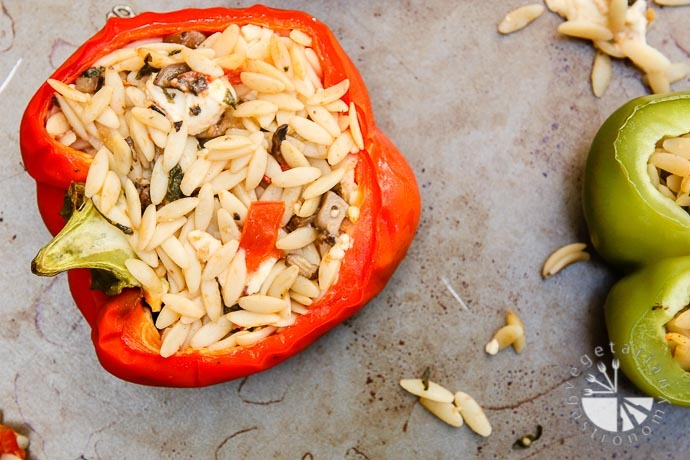 With orzo pasta, Mediterranean flavors come to mind. Therefore, I created this simple Mediterranean inspired recipe stuffed with orzo pasta, spinach, garlic, mushrooms, tomatoes, and feta cheese. My husband and kids loved it. My kids even ate left-over stuffing for lunch the next day. You can prepare the stuffing or even stuff the bell peppers ahead of time and bake them individually when you’re ready to serve. I love having these beauties available for lunch during the week. Typically after feeding my kids, getting them down for a nap, and cleaning the kitchen, the last thing I feel like doing is making is my own lunch, which ends up being the result of an afterthought. When I have these prepped and ready, it’s very easy to pop one in the toaster oven for a delicious hot meal! Next on my list for veggies to stuff… Acorn Squash! Also, if you haven’t already noticed below, I have a NEW BLOG FEATURE to share with all of you guys: Nutritional Information! It’s been on my list of things add and has been requested by many followers. From now on, there will be basic Nutritional Information listed in the Notes Section of every recipe. I will also be updating my previous recipes with nutritional information. You can view this feature on my recipe below or check out my recipe for Blueberry Banana Breakfast Cookies that has been update. 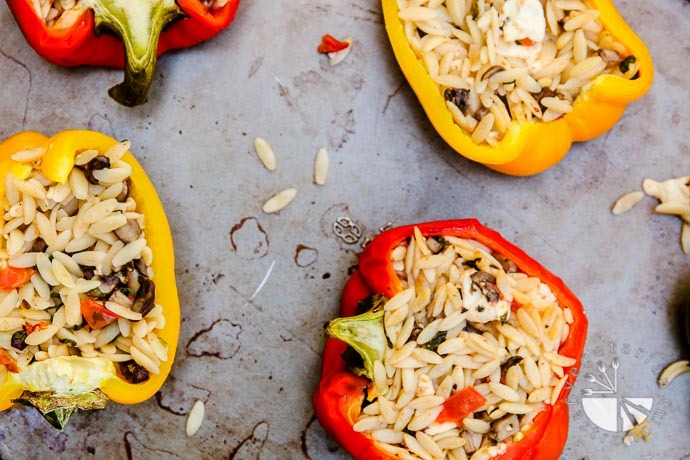 These Mediterranean Stuffed Bell Peppers can easily be prepped ahead of time. 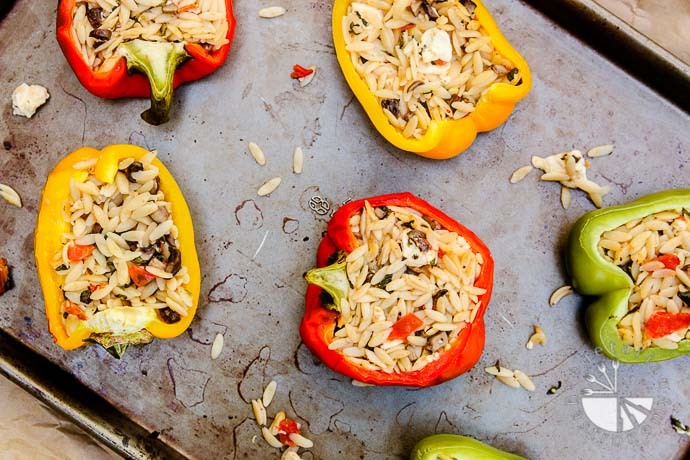 They're filled with orzo pasta, veggies, and baked to perfection. Bring a medium pot of water to boil. Add some salt and olive oil. Add the dry orzo pasta and cook until al dente according to package. Once done, drain, cool by rinsing pasta under cold water, toss with a small amount of olive oil to keep the pasta from sticking together, and set aside. In a large non-stick pan, heat 2 tbsp olive oil on medium heat. Add the minced garlic and saute until fragrant. Immediately add the diced mushrooms and saute until most of the water from the mushrooms is released and evaporated and the mushrooms are tender. Add in the diced tomatoes and chopped spinach, combine, and saute for a few more minutes until the tomatoes and spinach just start to cook in. Add the cooked orzo pasta and season with salt and freshly ground black pepper to taste. Add in the crumbled feta cheese and toss once more. Cut the six whole bell peppers in half lengthwise (i.e. through the stem). De-seed the bell pepper and remove any white parts inside keeping the stem intact to keep the stuffing from falling out. Lightly grease two 9x13 glass tray. 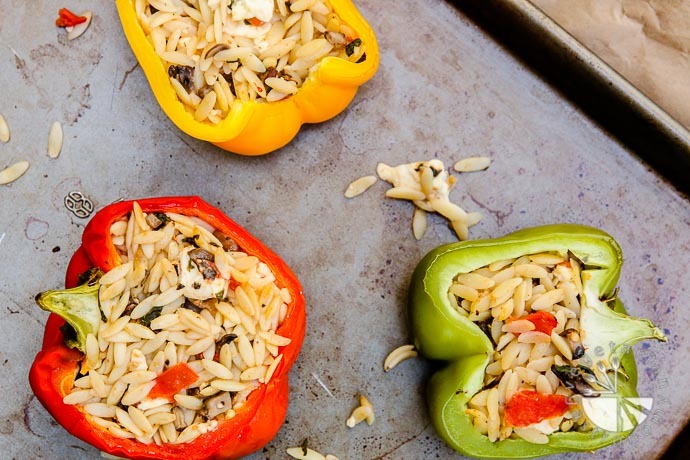 Completely fill each bell pepper half with the orzo stuffing. Arrange the 12 bell pepper halves in the greased glass tray open side up. 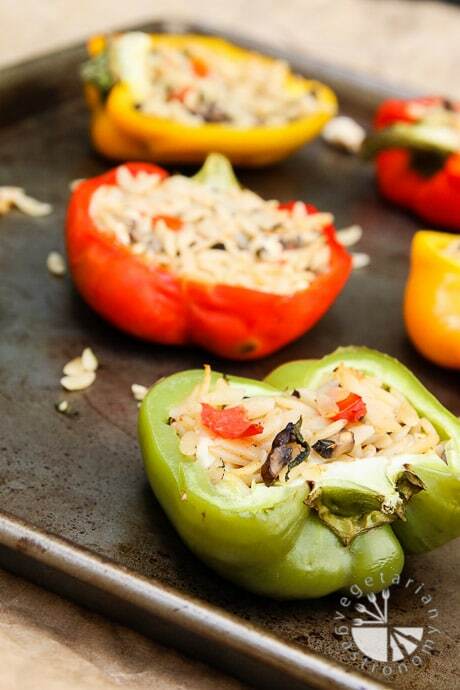 Bake the bell pepper halves for 30-40 minutes uncovered. Remove from the oven, garnish with some freshly ground black pepper, and serve hot! Make-Ahead Tip - You can easily stuff the bell peppers ahead of time, store in the fridge, and bake when ready to serve. Are you on Instagram or Facebook? Come follow me over there on my Instagram Account and Facebook Page! 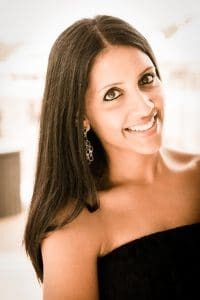 I’m always sharing daily new ideas and some recipes over there that I don’t always share here on my site. Amazing Dish! 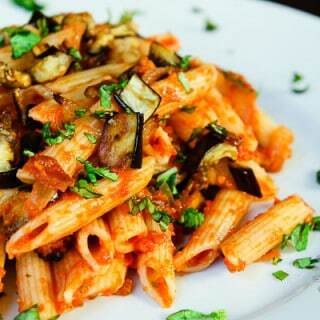 I used zucchini instead of mushrooms and chives instead of garlic (i'm avoiding root vegetables,) Thanks for the post! So glad you liked these stuffed peppers! They are one of my favorites...and great substitutions since you're avoiding root vegetables! They turn out good . We like it. How far in advanced can these be prepared and left in the frig until ready to bake? I've made them two days in advance and they turn out great! Just bake them the day of!